Avocado Tuna Salad Recipe - Home. Made. Interest. This Tuna Salad Recipe is quick and easy. Perfect for a quick lunch or a simple low carb meal. As much as I loved all of the time I had off over the holidays it has been nice getting back to my usual routine of going to work and eating low carb. No more sitting at home all day being tempted by Christmas candy, lol. I’m back to packing my lunch and eating healthy snacks. 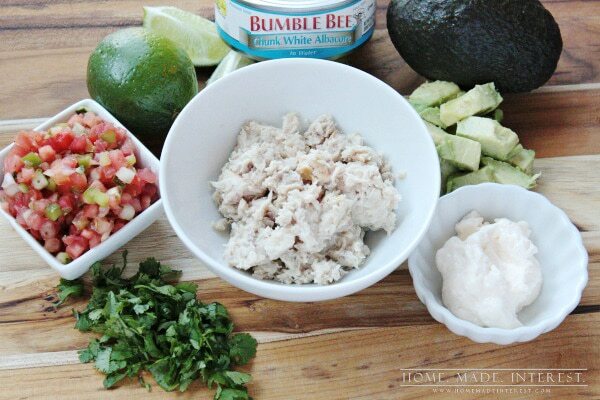 Bumble Bee® Tuna is one of my go-to lunches to take to work. It’s quick and easy, you know I love that. It comes in a can or a pouch, so you can just it grab and go in the morning. Bumble Bee® Tuna products come in so many different flavors, from Spicy Thai Chili to Sundried Tomato and Basil AND they are a simple, delicious, way to add a variety of nutrients to your diet, including lean protein, healthy fat, and important vitamins and minerals. Since I’m doing low carb that means no bread for me, so I am always looking for different ways to prepare my tuna. This week I made Avocado Tuna Salad for my lunch. It was delicious! I love avocados and they really added a creaminess to the tuna. 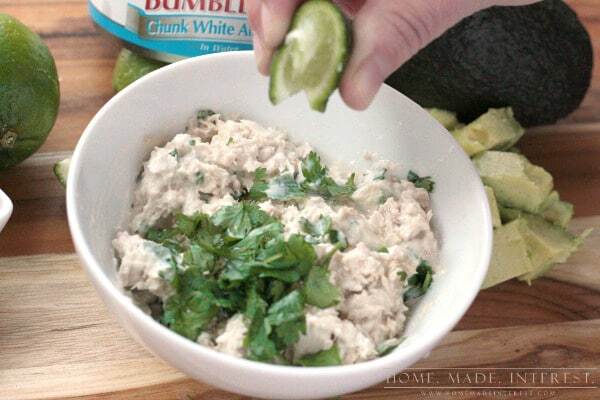 The recipe is simple, I mixed a can of tuna with a tablespoon of mayo, some chopped cilantro and a squeeze of lime. Then I roughly chopped up one avocado, sprinkled some salt over it and gave it a squeeze of lime. 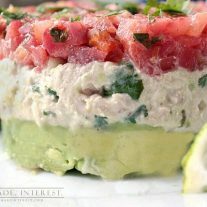 I served it by layering the tuna over the avocado and then topping everything off with fresh salsa. I fancied it up here by using metal food rings to shape the salad but when I took it to work I just layered everything in my food storage container and packed it in my lunch bag. This is recipe is definitely a keeper. It took me less than 10 minutes to make, and if I had the tuna already mixed up it would take less than 5 minutes. Perfect for when I’m rushing out the door in the morning. I loved the creaminess the avocado gave the tuna, with that little added zip from the lime juice. The salsa on top gave everything a fresh flavor that I thought brought it all together. 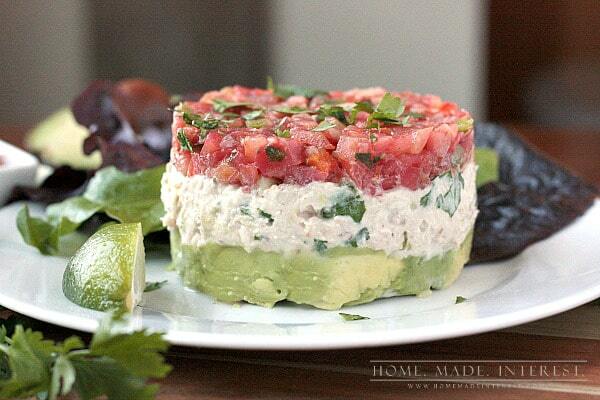 Tuna layered with avocado and fresh salsa. 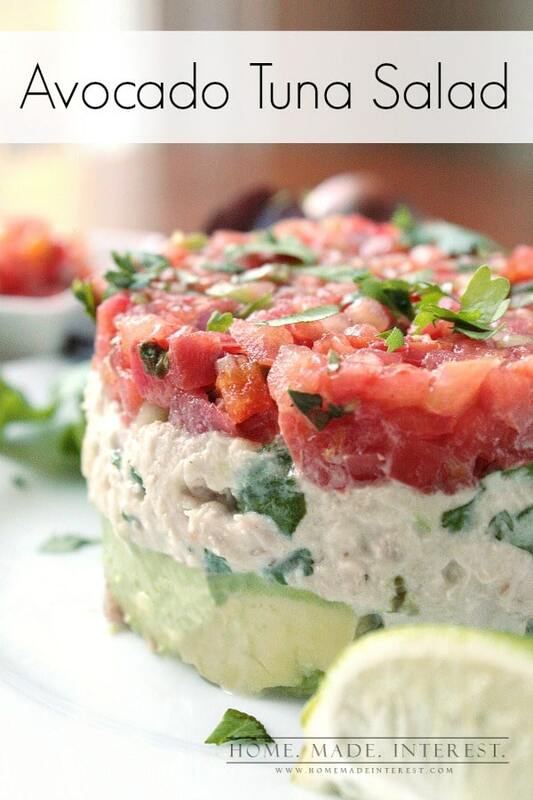 This avocado tuna salad recipe is a healthy low carb lunch recipe you're going to love! Drain the tuna in the can. In a bowl mix tuna, mayonnaise and cilantro. Squeeze half of the lime over it and add salt to taste. In a bowl lightly mash it, leaving some chunks. On a plate make a layer of avocado. Then layer the tuna on top of that. Finish it with a layer of fresh salsa. We for more tuna recipes try our Stuffed Tomato Tuna Melt and Tuna Casserole Stuffed Shells. Next Post » Game Day Party! This looks so yummy! and pretty too! Pinning to remember. omg trying this tomorrow!!!! totally up my alley… yummo! Now this looks like a stack that I would happily tuck into. 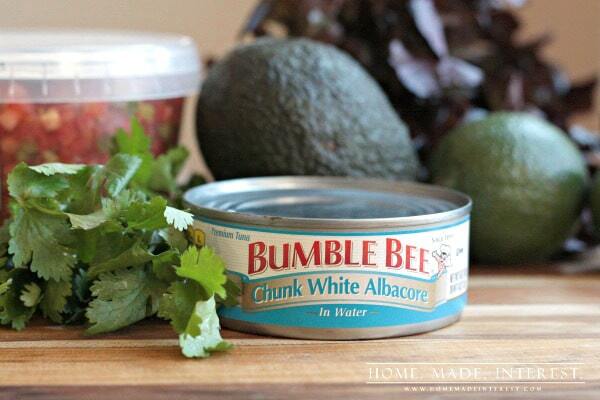 Tuna AND avocado….simply spells yum! This looks super tasty! With all the heavy foods I just finished scarfing down during the holidays I definitely need to be making this soon! I found you, by the way, over at Work it Wednesdays link party. I am over at penniesintopearls.com and I am super excited to start following your blog for more ideas on recipes, DIY and crafts! Looks so good…I would love these flavors together. Thanks for sharing with the Thursday Blog hop! Mmmm…this looks delicious! Anything with a whole avocado all for me in the recipe, and you can count on me jumping right in! 🙂 Looks so pretty all stacked in layers! Pinned! This is so gorgeous, Kat! I’m vegetarian, so I don’t eat tuna, but I’m going to try to adapt it. What a great lunch idea! love this , and I always like pretty food too. Thank you for sharing at the Thursday Favorite Things blog hop. xo P.S. did you see my new giveaway? Your gorgeous salad will be featured tonight at Foodie Friday and Everything Else. Have a great weekend! Congrats on the feature at Foodie Friday! This looks so good! YUM YUM! So quick and easy to make, too. I didn’t have any cilantro so I substituted dill which is always good with fish. I’ll bet this would be tasty with canned chicken as well. Thanks for sharing! Dill is such a good idea I’m going to try that! Maybe with lemon…. 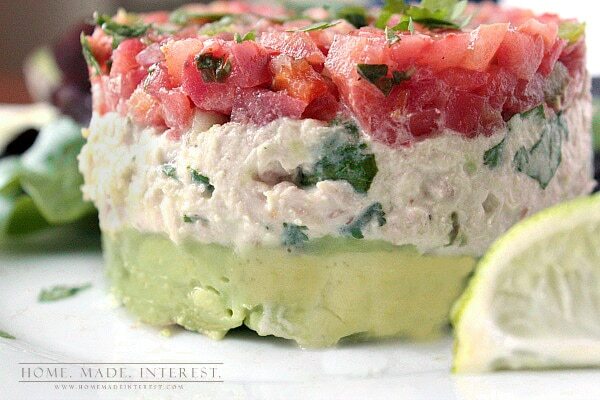 This has potential esp using the Coriander with the canned tuna. One could even use Guacamole on the bottom. Looks my type of food..look forward in trying it for my lunch this week! !